I don’t want to get into a whole thing about girly foods versus manly foods. As a woman, read more I do love my salads, food dainty cheese tarts and chocolate. But not any more than I love big, beefy burgers, buffalo wings and nachos. Food is delicious and I will not take sides! Even after all that, I have to say, this pasta salad is a manly salad. It’s hearty and bold and full of freshly grilled steak. It is not a side dish. It’s an aggressive, filling entree. The first time I made this, I tossed everything with a little vinaigrette and topped it with diced avocado and crumbled blue cheese. It was good, but it was missing something to tie it together. I tried again, this time making a creamy dressing with the avocado and blue cheese and … success! The dressing pulled everything together like mayonnaise usually does. 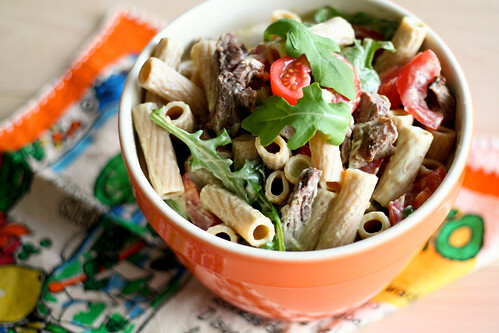 The rest of the ingredients – pasta, tomatoes, red onion and steak – completed the salad. I loved it, Tom loved it. This is a salad for all the sexes. Start by making your dressing. Combine all of the ingredients in a blender or food processor and blend until smooth. Set aside or refrigerate for up to 2 days. Next, make the steak. Heat your grill to medium-high. Sprinkle the steak with a little salt and pepper on all sides, then grill for 3 – 4 minutes on each side. It’s done when the outside is slightly charred and the inside is still pink. Remove to a plate and let rest for a couple of minutes, then slice into bite-sized pieces. While your steak is cooking, boil the pasta is salty water. Once it’s al dente, remove to a strainer and run cold water over the pasta to stop it cooking. Drain completely. In a very large bowl, combine the pasta, tomato, onions, arugula and steak, pour the dressing over it and toss. Serve at room temperature. Makes 4 – 6 main servings. The dressing sounds out of this world. We haven’t used sherry vinegar, so it’d be a new flavor. This looks so yummy and easy! I dont like to take sides either! Woman or man food..regardless that pasta salad looks AMAZING!! Looks very tasty! But I haven’t found a blue-cheese dressing I like… any suggestions what could be substituted for the blue-cheese? Ranch-Avocodo perhaps? Great combination of ingredients. Nothing goes together better than steak and blue cheese. When avocado is added – well, it is officially pushed over the top! This was fantastic – we used spinach and didn’t have sherry vinegar on hand. We used red wine vinegar, and it was great! Definitely a keeper. this looks and sounds delish! i can’t wait to try it out! Hello, just stopping by and dropping you a note to say that I enjoyed your Blog. Keep up with the good work! This is an inspired combo of flavors! Thanks for sharing. Unfortunately, I found it to be quite salty; next time, I will cut the salt in the dressing by half. But there will be a next time! This site appears to get a great deal of visitors. How do you get traffic to it? It offers a nice unique spin on things. I guess having something real or substantial to talk about is the most important thing. a co-worker who had been doing a little research on this. But yeah, thanks for spending time to discuss this matter here on your website.